Together colloborating with the media, we exposed massive deforestation issue taking place at Knuckles World Heritage Cloudforest. A road several kilometers long has been cut right through the heart of the protected reserve without any environmental impact assesment. Rainforest Protectors of Sri Lanka is asking authorities to take immediate action against all those who are responsible. Discussion with Minister of Wildlife and submitting letters/offering solutions to relevant Government authorities to mitigate human-elephant conflict in Sinharaja World Heritage Rainforest. A public protest organized by Environmental groups including Rainforest Protectors of Sri Lanka, along with village socities will be held in front of Central Environmental Authority headquarters on Wednesday January 25, 2017 from 9:30am till noon to demand immediate halt of mini-hydro projects that are causing severe ecological and social issues around the country. Dunumadalawa rainforest and reservoir that supply water to city of Kandy is in danger due to severe encroachment. Reported to authorities and media by Rainforest Protectors of Sri Lanka. 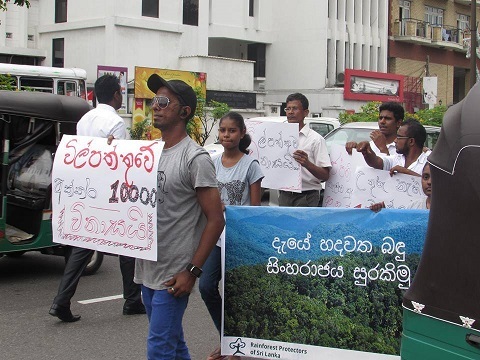 Rainforest Protectors of Sri Lanka reported and campaigned against the destruction of Ethamala Ella falls, the only waterfall of Nilwala River, due to a private mini-hydro project. Rainforest Protectors of Sri Lanka reported and followed up on an incident of human induced fire at Handapan Ella Forest in Rakwana. Campaign is targeted at identifying the culprits, replanting the site with native trees and prevention of future incidents. Rainforest Protectors of Sri Lanka submitted the following letter to UNFCCC, UN-REDD, UNEP, UNESCO, IUCN as well as local government authorities highlighting the explosive growth of mini-hydro projects within protected rainforests and their buffer zones which threaten the endemic flora and fauna as well and destroy pristine streams and waterfalls. Rainforest Protectors of Sri Lanka submitted all evidence of massive destruction to Dellawa rainforest and Anda Dola (a tributary of Gin Ganga) due to construction activities of a mini-hydro project to relevant government authorities. Further, a media campaign was carried out successfully, to bring attention to the issue. Upon identifying massive damage done to Sinharaja World Heritage Rainforest buffer zone at Koskulana river due to an illegal mini-hydro project, an all out campaign was launched to get the authorities to take action as well as educate the public on the issue which has been kept secret by Central Environmental Authority. No Environmental Impact Assesment nor public notice / comment period has been carried out for this project that is being done at a World Heritage Rainforest and directly impacting river buffer zone. Rainforest Protectors, drafted and delivered below letter to Kuruvita Divisional Secretariat and media proposing solutions to address the garbage issue at Bopath Ella in Kuruvita, Ratnapura. Bopath Ella or Bothal Katu Ella – will the authorities take action? Rainforest Protectors, drafted and delivered below letter to Government Authorities and media requesting to declare the endemic and endangered Hora (Dipterocarpus Zeylanicus) tree as a protected species. Rainforest Protectors, drafted and delivered below letter to Government Authorities requesting to address lake and river pollution issues in Kandy. Rainforest Protectors, drafted and delivered below letters to Government Authorities titled "Environmental Destruction in protected Sripada Sanctuary due to Illegal Mini - Hydro Project". The letter calls to immediately halt this destructive and illegal project inside Sripada World Heritage Site, which violates the Flora & Fauna Protection Ordinance. 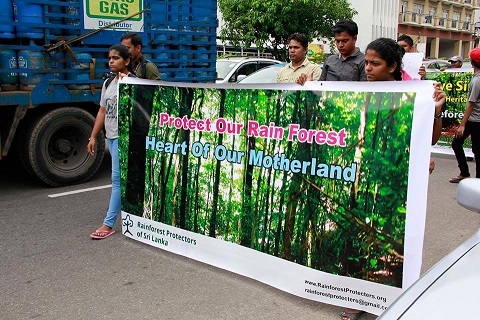 Rainforest Protectors, drafted and delivered below letter to Government Authorities requesting to deny the illegitimate proposal made by Minister Lakshman Kiriella to construct a public motorable road through historic Udawattekele Forest Reserve in Kandy. 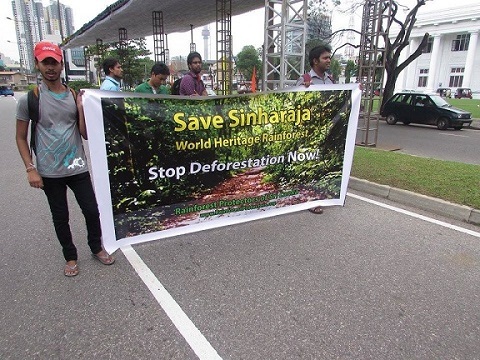 Rainforest Protectors, drafted and delivered a letter to Government Authorities titled "Requesting immediate action to protect Sinharaja World Heritage Rainforest". The letter calls for immediate action to expedite the acquisition of 2,500 hectares of Land Reforms Commission rainforest land into Sinharaja as well as protect unprotected rainforests in the Rakwana-Deniyaya hills. Rainforest Protectors, drafted and delivered a letter to Government Authorities titled "Request to take immediate action to stop the growing poaching crisis". The letter calls for immediate action to stop the growing poaching issue and the use of cruel Hakkapatas to kill or harm wildlife. Rainforest Protectors with the support of Federation of Environmental Organizations, drafted and delivered a letter to Government Authorities titled "Recommendations for Ecologically-Sustainable Town Planning and Road Design". The letter calls for a more sustainable approach to town planning and road design, as some recent decisions to construct roads through National Parks, Protected Forests and Wetlands have resulted in heavy losses to Wildlife and Bio-Diversity which ultimately directly impacts Eco-Tourism in our country. The letter was delivered via Fax, Email and Registered Post Mail to the President Maithripala Sirisena, Prime Minister, National Physical Planning Department, Urban Development Authority, Road Development Authority, Ministry of Economic Development, Central Environmental Authority and Ministry of Environment. We hope, the message is absorbed by the above authorities and future decisions and actions will reflect that our country can move to a Sustainable Development model in-line with the recommendations proposed on this letter. Rainforest Protectors exposed a major Solid Waste Pollution issue in Morahela, Panwila within Knuckles World Heritage Forest, where Solid Waste from nearby town was dumped and pushed over a mountaintop. Our volunteers interviewed the villagers and people passing by this waste dump, reported it to the authorities (Central Environmental Authority, Ministry of Environment and Panwila District Secretary) to take action as well as publishing the issue on the media. We are currently carrying out follow-up conversations with the respective authorities to address this issue in a timely manner. Rainforest Protectors of Sri Lanka is calling upon volunteers to help our protest campaign to stop the destruction of 600 acres of Muthurajawela sanctuary for a Golf course. We need volunteers to visit the Muthurajawela conservation center in Bopitiya to discuss this issue and how to join in protest. We also need volunteers to give publicity via social media and print media. Please email RainforestProtectors@gmail.com if you can help us. Rainforest Protectors of Sri Lanka issued the follwing letters to Forest Department regarding the need to address many issues within Hora Kele Forest Reserve as uncovered by our volunteers during a recent visit to this small rainforest patch. Recent investigation by Rainforest Protectors volunteers exposed polluted water from near by houses/hotels being diverted into Galways land national park in Nuwara Eliya. We are calling upon authorities to investigate and take measures to stop the pollution immediately. A new road is currently being built through Sinharaja World Heritage Rainforest buffer zone. At a time when illegal encroachment is threatning Sinharaja World Heritage Rainforest, we need to be taking measures to give it strict protection status. However, it seems that politicians who just look for short term gain is destroying the natural treasures our ancestors handed over to our generation. RAT is currently on a mission to document the destruction caused by this new road and submit the information to local authorities who are supposed to protect the rainforest, media for reporting, as well as international authorities monitoring primary forest destruction in Sri Lanka.